This column will appear online Saturday, May 28, 2016 at 9 AM EST. It is available before in the May 27th issue of Prince William Today on sale at these retailers beginning this Thursday, May 26 in the afternoon. Commands you can give Google Now / Assistant today. Your home likely has its own facilities manager – the person whose job it is to make sure the heater filters get changed, the outside water is turned off for the winter – that sort of thing. Your home also likely has someone who has central oversight of the technology – or should. Back when technology in the home meant one personal computer, that computer was in the family room for all to share. More or less, one person was in charge and made sure there was enough disk space for all, and would do updates to the operating system periodically. But as computers became cheap and many families got one for every member, or some may have abandoned using a PC in favor of tablets or phones, central control was often lost. Yet a level of oversight is still needed. All the devices in the home likely use wi-fi, so someone needs to make sure it is working-- as well as knowing how to reboot it if needed and when that is needed. That person needs to be the one to contact the internet service provider if there is a problem. 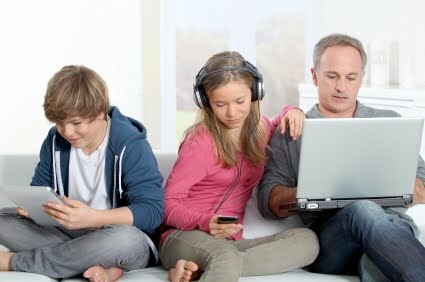 If you decide to appoint someone as the family IT director, the first thing that person should do is create an inventory of all devices, their model numbers, purchase dates and who uses them. That person also needs to know what version of the operating system the devices use, if they are actively used and even if they still work. Capture the serial numbers and any other necessary information, such as if there is a service agreement, and keep all this on a spreadsheet. If you have devices no one uses, consider selling them on sites like Gazelle, eBay or Craig’s List. For PCs, the family IT director should check to see that antivirus software had been installed and that scans are being done regularly – at least once a week. That person should check to see if there are any viruses or malware on them that need to be dealt with. Often if someone does not know how to deal with a problem, they’ll let it ride and hope for the best. But a virus on one PC could spread to others on the home network. The IT director should have a regular schedule for auditing a device to make sure scans are working, backups are being done and there is still adequate hard-drive storage. If it is a child’s PC, have them sit there with you so they know you are not snooping, and they will learn what you are doing and why. If there is any mission-critical data on the PC that should be backed up regularly, the IT director should put a backup process in place for all PCs, and make sure all phones are automatically backing up photos to somewhere like Google Photos. Updates to apps and the operating system not only give you new features but also apply critical security patches. The IT director should ensure everyone is educated about safe computing. They need to know not to open attachments on emails unless they are certain who sent them and the attachment is something they would send. Schools now teach digital citizenship as early as kindergarten as part of their technology curriculum. Ask your child to show you what they have learned. Ramsonware, harmful software that encrypts your data and demands big payments, often comes as an attachment on an email designed to look like something important from your bank, the IRS or some other entity. Know how old your devices are and if they are due for a replacement. If you have a PC still running Windows XP, it is too old. Eight years is old for a PC. If a PC is too old for an upgrade to Windows 10, it’s time to think about a new PC. Likewise with phones. One more than 3 years old will not support the most recent versions of iOS or Android, and that could lead to security problems. It’s a thankless job being the family IT guy, but future columns will try and make it a bit easier. This column will appear online Saturday, May 14, 2016 at 9 AM EST. It is available before in the May 13th issue of Prince William Today on sale at these retailers beginning this Thursday, May 12 in the afternoon.